A Prima magazine subscription provides real-life guidance, inspiration & ideas to simplify the lives of modern women today. 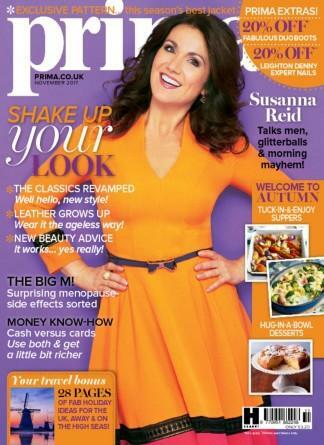 A subscription to Prima magazine offers a little something for all women - advice on how to look and feel your best, time and money-saving solutions, quick and easy food recipes, beautiful homes and gardens, and above all, everything you need to get the most out of life. Prima caters for every stage of life - using reader experiences and real-life stories, as well as expert advice from those in the know. The magazine covers a broad range of subjects in a warm, helpful and fun way. Prima magazine is a trusted source for consumer information, with professional advice on health and wellbeing, best buys, your family, career and much, much more. Prima understands their readers' busy schedule and aims to be the antidote to your everyday stresses. With a Prima magazine subscription almost anything is possible - beauty is attainable, fashion is wearable and cookery is easy but the best part about Prima is that everything is affordable. Subscribe to Prima today and treat yourself to a great read every month!